In the history of epic sportstering feats, our finish during Sunday’s Konquer the Konza race will never end up in the headlines. Except it was my second favorite “race” ever. As you can see from the finish-line glamour shot to the left, the pot of gold at the end of that race rainbow included Tallgrass Pale Ale and a pizza. Could it get any better? Race day began like most others, snoggy groggy in bed and rolling towards the door with bottle, body glide, and my Sunset Zoo hat. Standard race-day goofiness on the drive to the Konza ensued and Napoleon Dynamite dance moves on the mosey from car to the race start. That’s when I began to notice the difference in the run up to this starting line. I was having fun. FUN. No weepy nauseous worry that I’ll embarrass myself (that is a given), no sense that I had to be the dark horse and win a medal from way behind in the pack – only calm and fun. And so after a few don’t-frolic-with-the-bison warnings and meeting up with high school best bud, Jill, the horn sounded. We shuffled under the race start arch. People whizzed past us on the left and right. We motored by a few. I thought I saw a giant snake in the fence (not a snake.) It was fun and hilly. A prairie morning mist burned off in the distance. A wee bit into the run, we decided to walk for a moment. Normally, this would be cause for alarm. All those people we need to catch up with and pass again! But during Konquer the Konza, slowing down became the best thing. You see, we never started running again. There I was, on a fall Sunday morning worthy of a National Geographic two-page spread…with my best friend…traipsing along the back “unpublic” roads of the Konza…with the promise of pizza and the tastiest adult beverages at the end. This day – walking my race – was becoming a best day. At our feisty walking pace we easily cheered people on, chatted up the awesomesauce volunteers (great volunteers make the race), found a couple of turkey feathers, posed like superheroes for photos, and powered our bunions up hill and dale in the prettiest place in America’s Flint Hills, the Konza Prairie. Yes, we felt squirrely at first when we realized that we were going to walk the course. But our egos and memories of half-marathons and tris were no match for the good company, magnificent morning, and chance to walk nearer the bison to thee. We had the time and breath to see the good world around. Time to laugh and soak it all in. 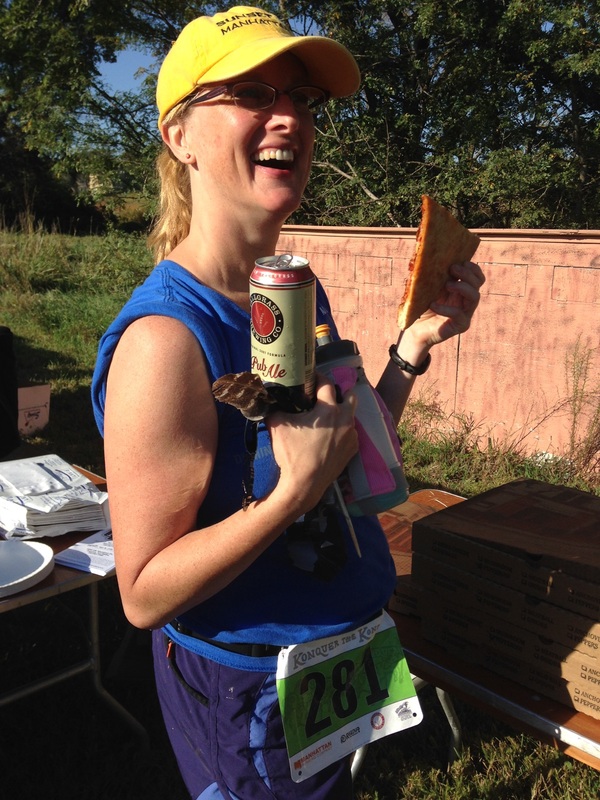 Our finish line did indeed include beer and pizza. Jill, the woman responsible for my mad skills driving a stick shift, was there at the finish. Hurrah! So were good soggy faces of other runners and their supporters. Bonus: M3 careened up in her Mini Cooper with a fresh batch of pizza and my framily was nearing full assembly that day. We ate our pizza in the sunshine while a flock of jakes scuttled off in the distance and the young Republicans behind us tried to find fair reasonable solutions to the world we live in. Surprises abound. One beer after a 10K in the early autumn sun and I was wibbly-wobbly. Thankful that Katie drove us home and made sure I was safely supine in my apartment while Sunday morning rose full over the Flint Hills. Giggling now as I write this. I cannot think upon this race with anything but gratitude. We came to run. We walked instead. We discovered our better adventure. So there it is, Kids: sometimes slowing down takes uncommon derring do and the rewards can be legion. Try it this week. Slow down. Soak up the good stuff of this short life. And pose like a superhero when you get the chance. Nice post. I ended up walking about 20% of the race as well . . . it just felt better.